All enthusiasts look for the same qualities from their systems: Verisimilitude to the original event, a sense of engagement promoting suspension of disbelief, a visceral immersion in the audio and video experience. To engage without effort requires meticulous preparation of the entire playback chain, especially signal-carrying cables, and especially the power cord which carries the same signal your system plays back. Picking up a Furutech power cord, from these supple, beautifully-made upgrade power cords for high performance audio, the integrity of the cable’s build is immediately apparent. Furutech Pure Transmission quality turns a macro lens on every element of power transfer applying optimized engineering solutions to well-known problems such as contact resistance, EMI and RFI rejection, and using the best materials and processes available. The Roxy Power Cord, with its slimline FI-C15 IEC connector is the perfect cable for those components with space restrictive IEC inlets that require a small IEC connector. 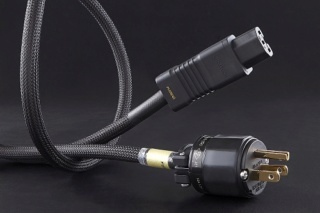 It is also the perfect power cord for turntable and phono stage use. The Roxy Power Cord has been designed and tuned to complement a wide range of analog components. It delivers a balanced energy allowing for a powerful, yet stable and defined bass. Greater extension at both low and high frequencies delivers clears and dynamic imagery in an ultra-quiet soundstage. The new slimline IEC connector also allows for easy connection to light weight components, like phono stages and is perfect for fitting space restricted IEC sockets that can be found on some high-end components. • Floating Field Damper US Patent No. : 6,669,491/ European Patent (EP1445837) for FI-11M(G) version only. • Insulation: Audio grade Polyethylene (Red, Yellow, Green) OD: 3.5mm diameter approx. • Sheath: RoHS-compliant Audio grade flexible PVC (Dark Red), 10.0mm diameter approx. • Outer Sleeve: Nylon yarn braid (Black), 10.8mm diameter approx.